We started of our day with a wonderful breakfast followed by meeting 2 of our English speaking guides. Of we were whisked to the Olympic Ski jump where we witnessed 3 retired ski jumpers who had retired at the age of 23 years old. They amazed us by soaring through the air and landing on artificial turf right before our eyes. We were then treated to a ride up to the very top of the ski jump and our eyes feasted on a spectacular view of the city and the backdrop of the Alps. 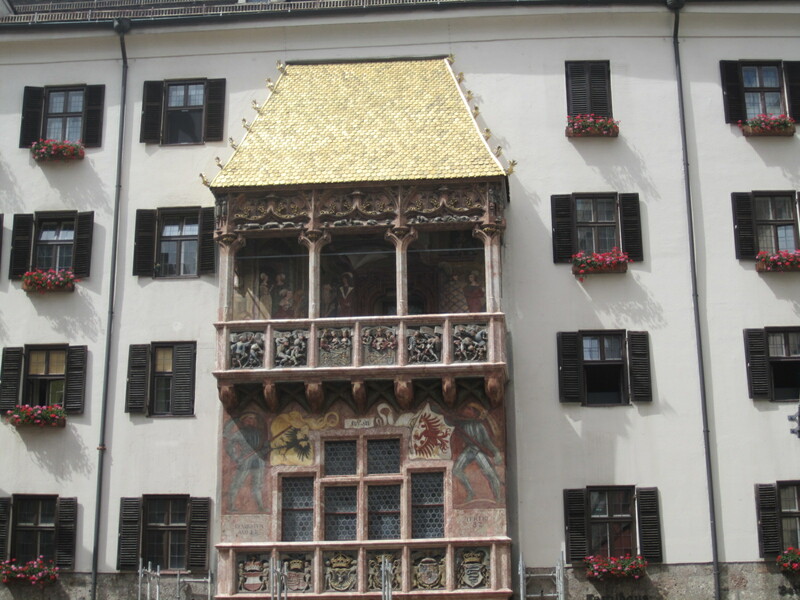 We boarded our coaches and then proceeded to the city centre where we took a guided tour of the Old Town where the streets were lined with attractive facades of numerous Baroque buildings including the Goldenes Dachl (Golden Roof) which is the symbol of Innsbruk, with its oriel window added in 1500 and covered with 2657 gilded copper tiles. We were indeed fortunate in that we were present for the uncovering of the roof that had been covered for cleaning for 1 year. 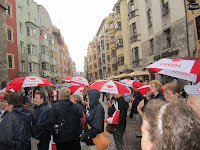 In the middle of a downpour in front of the Golden Roof we broke into Singing in the Rain accompanied by the dancing of our tour guide. Our second FLASH MOB! This was then followed by our second most favourite thing – Retail Therapy J Some of our group opted to go to a wine tasting event. 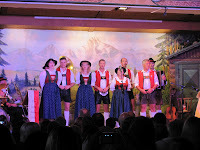 Our day was concluded with dinner and entertainment at a traditional Tyrolean show where we encountered our first yodeller and some dancing that was representative of this area. The singing and dancing was accompanied by instruments that were definitely not made in Canada. 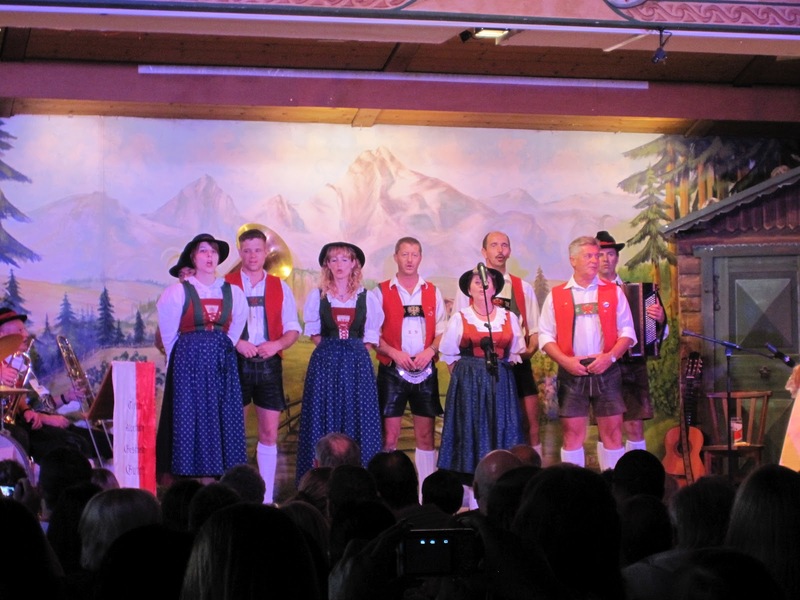 The show ended with a multi-national sing-along where the national or unofficial national songs of more than 20 countries were sung. 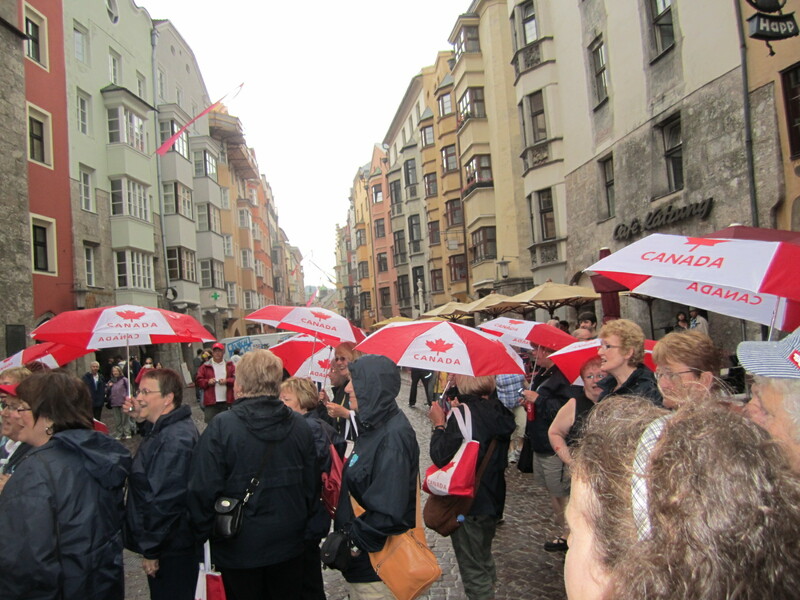 Canada was well represented with the most boisterous singing. France never had a chance J We will always remember a very special MOOOOO!!!!!!! This moment would have to be explained in person when we see you. 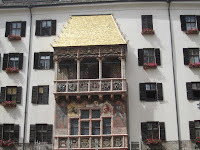 Back to our hotel and to pack for our journey to Salzburg.